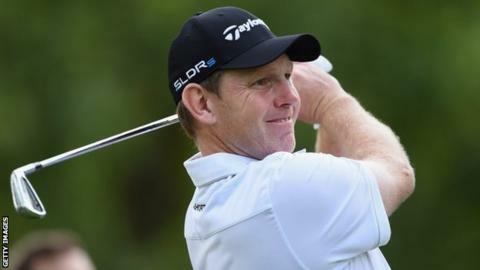 Scotland's Stephen Gallacher opened with a 72 at the Italian Open as he targets a top-two finish that would earn him a Ryder Cup place. The 39-year-old could knock Northern Ireland's Graeme McDowell out of the automatic places in the Europe team. He is five shots off early leaders John Hahn and Gareth Maybin in Turin. "I have to finish first or second, that's not going to change, so I'm not putting any pressure on myself," Gallacher said. "Once you get out on the course you just try to birdie every hole. That's the easy part. It's when you finish you think about the Ryder Cup. "It's okay for the first day and I am only one good score away from the top of the leaderboard." After starting on the tenth, Gallacher picked up two birdies in his first three holes in Turin but three bogeys in four holes after the turn played a part in him carding an even par 72. American Hahn and Northern Ireland's Maybin led the way with rounds of 67. English Ryder Cup veterans Lee Westwood, Ian Poulter and Luke Donald are outside the qualifying positions and will have to rely on selection from captain Paul McGinley for the match against the United States at Gleneagles from 26-28 September. Italian Francesco Molinari boosted his hopes of securing a wild card selection with an opening round of 66.